February Soil Preps, Very First Spring Planting! The beauty of planting from seeds is you can get perfect varieties, the rare and unusual! Planning now is important because not all spring/summer plants are installed at the same time. Planting in the right places now makes a difference. Bold Souls will be planting Zucchini, cool tolerant tomatoes, cherry tomatoes, and corn! They can be started now from seed, in the ground. March is a little warmer and early variety plants get a better start. April is most everything – cucumber, pepper, squash, beans, more tomatoes, watermelon. May is the true heat lovers, cantaloupe, okra (June may be better yet), eggplant. Some gardeners wait to plant tomatoes until May and June to avoid the more moist soil fungi of earlier months. I hold that space by planting something temporary there in March. June is good for okra, eggplant and long beans! If you are not going to be canning, indeterminate tomatoes are the excellent choice! These are the vining tomatoes that produce all summer! This saves time and water because determinate, bush tomatoes produce quickly, all at once – great for canning, then you have to replant and wait for more production. However, determinate toms do produce sooner, so for earlier table production, plant them to hold you until your indeterminates are producing. Also, for earlier production, plant cherry tomatoes! Yum! Basil is great with tomatoes, and a pack of dandelions! Plan to put cucumbers up on trellises to keep them disease and pest free, are clean, and so they ripen evenly all the way around. Co-plant with beans! Beans above, cukes below. Japanese Long cukes give a generous supply per water used! Suyos are a great choice – give them plenty of room. Next, intermingle mid height plants, bush beans, determinate tomatoes, tall peppers like Big Jim Anaheim or Poblanos, zucchini! Potatoes with zucchini to repel squash bugs. Plant Radish ahead of cukes & zukes to repel cucumber beetles. Eat a few, but let several grow up by and through the plants you are protecting. Leave a winter broccoli or two for salad side shoots. Mulch deeply under your brocs right now! We want to keep these cool loving plants cool. If you don’t have enough trellis space, plant cukes under your brocs! Broccoli helps repel cucumber beetles, so push the mulch back on the sunny side, make your special cucumber planting mound/basin and plant cucumbers underneath those brocs! The mulch does double duty. It keeps the cukes off the soil, clean and insect free above the bug zone! Super use of your space! As winter plants finish, that space might be planted right away. Other space may need to be held for later. For example if you plan to plant okra in June, grow quick prolific producers there until it’s the right time to plant those heat lovers! Leafy plants produce continuously, and can be harvested whole body when you want the space. You will have lush harvests while you are waiting. Think of kales, chard, lettuce, beets, even mini dwarf cabbages. Perhaps you will leave some of them as understory plants and plant taller peppers like Poblanos or Big Jim Anaheims, and tomatoes among them. When the larger plants overtake the understory, either harvest the smaller plants, or remove or harvest lower leaves of larger plants to let the smaller ones get enough sun to keep producing abundantly. And you can always plant a quick growing legume, green manure, aka living mulch, to feed your soil! Choose early cold tolerant varieties. Ones with northern names, in SoCal that could be Oregon Spring, or Siberian. Stupice from Czechoslovakia is very early! Bellstar, from Ontario Canada, is larger and earlier than other plum tomatoes. Early Girl is a favorite! And SunGold cherry tomatoes are almost always a winner! Cherry toms are small and will ripen when other tomatoes just stay green until the 4th of July! One more round of green manure is doable where you will plant late April, May. Grow it where you will grow heavy summer feeders like tomatoes, potatoes, eggplants, peppers, chilis, squash, pumpkins, cucumbers, melons, and corn; hungry stalk vegetables like celery, fennel, rhubarb, and artichokes; or continually producing green, leafy vegetables like lettuce, spinach, Swiss chard. Green manure can be beautiful favas, bell beans, or a legume mix to boost soil Nitrogen. Favas are big and you get a lot of green manure per square foot. With our warming weather, longer days, your green manure will grow quickly! As soon as it begins to flower, whack it down, chop into small bits. Let it lay on the soil 2 days to 2 weeks, then turn under. Wait two to three weeks then plant, plant, plant! It’s more tender to chop while it’s smaller. Taller is not better. Depending on which plants you choose, the process takes about 3 1/2 months. When you put in seeds, sprinkle a bit of Sluggo type stuff around immediately to keep snails and slugs from vanishing upcoming seedlings overnight, making you think they never came up! No, they didn’t let you down. Killing off the creatures ahead of time saves the babies. It stops new transplants from being seriously damaged or entirely mowed while they are small. Do this a few times, to knock off the generations, and there will be no tiny vegetarian predators for a while. Pull away those blotchy sections the leafminers make on chard and beet leaves. Remove whole leaves that are too funky for rescue. Harvest the bigger outer lower leaves more often to stay ahead of the miners. I believe sometimes the leafminers come when the beet needs to be harvested, when the foliage is just past prime. Rather than row planting, letting the leafminers go from plant to plant, interplant, a few here, a few there. Water a tad less so leaves are less soft and inviting. Aphids Watch for leaves unnaturally curled along the length of the leaf, particularly broccolis, cauliflowers, kale, cabbages. Check at the center where the tiny new leaves are beginning. Hose aphids off chard, kale and brocs. Keep doing it for a few days to catch the ones you missed. After that, water them a little less. Prevention A frustrating typical disease is Powdery mildew. It’s common on Curly Leaf kales, peas. Plant leaving plenty of space for air circulation. Apply your baking soda mix. Drench under and upper sides of the foliage of young plants to get them off to a great start! Do this the same or next day if transplanting. A super combo is 1 regular Aspirin crushed and dissolved, a 1/4 cup nonfat powdered milk, heaping tablespoon of baking soda, a half teaspoon liquid dish soap per gallon/watering can. Reapply every 10 days or so, and after significant rains. Not only is prevention so much better than after mildew has set in, but this mix stimulates your plant’s growth! See Aspirin Solution. Watering & Weeding is important after rains. Winds dry soil quickly and roots of short rooted plants like peas, or seedlings need to be kept moist. Some rains wet only 1/4″ deep or less. Poke your finger into the soil and see if it is moist deep enough to reach the roots of your plants. Thinning is a form of weeding! Thin plants that need it, like beets whose seeds start in foursomes! Thin plants you intentionally over planted – carrots, beets, turnips, kale, chard, mustard, radish! If you planted too close together, take out shorter, smaller weaker plants. They are all great in your salads along with small tender Brassica leaves. If you don’t thin, plants grown for their roots don’t have room or nutrition to grow that root. They literally starve each other out. So thin sooner than later. If you miss the window, thin or not, you won’t get your root. When you are weeding, remove blooming or seeding plants first!!! When grass has those pretty frilly little green tops, it is blooming and seeding! Remove it ASAP. Better yet is to remove weeds before they seed! 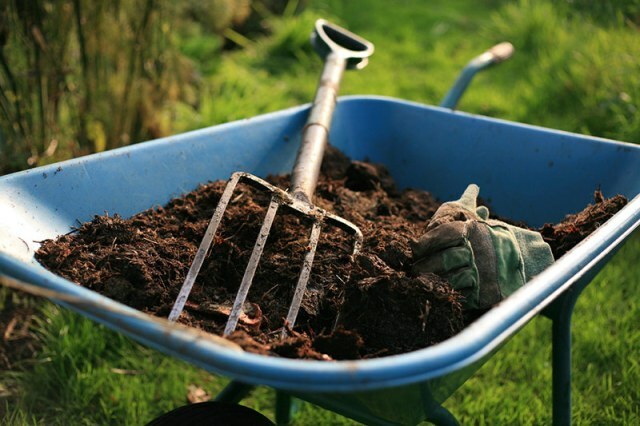 If at the seeding stage, gently pull, don’t shake the soil loose from the roots spreading seeds all over, and don’t put them in your compost! Love it up this February! Looking forward to a fine spring season! I’m so grateful for having all you garden friends in my life! I love sharing, gardening, learning, being outdoors in all kinds of weather together! Please enjoy some lovely Pilgrim Terrace January images! See the entire February 2018 GBC Newsletter! Tomato Varieties! Humble to Humongous and More! German Chamomile: Easy to Grow, Easy to Use! Upcoming Gardener Events! 48th Annual EARTH DAY Santa Barbara!